Check out Tobi's Zohar Plunging Blouse It's the simple things. The Cream Zohar Plunging Blouse is a wardrobe standby you can count on. With a swing cut and long sleeves, the plunging blouse has a deep v neck with criss cross straps to keep things interesting as you take it from day to evening (which you will). Pair this boho top with ripped denim. It's the simple things. The Wine Zohar Plunging Blouse is a wardrobe standby you can count on. 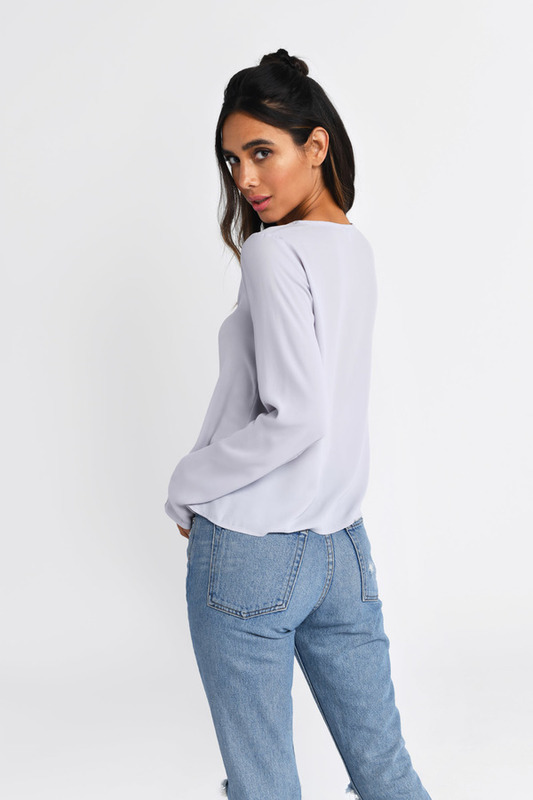 With a swing cut and long sleeves, the plunging blouse has a deep v neck with criss cross straps to keep things interesting as you take it from day to evening (which you will). Pair this boho top with ripped denim. It's the simple things. The Grey Zohar Plunging Blouse is a wardrobe standby you can count on. With a swing cut and long sleeves, the plunging blouse has a deep v neck with criss cross straps to keep things interesting as you take it from day to evening (which you will). Pair this boho top with ripped denim. It's the simple things. The Black Zohar Plunging Blouse is a wardrobe standby you can count on. With a swing cut and long sleeves, the plunging blouse has a deep v neck with criss cross straps to keep things interesting as you take it from day to evening (which you will). Pair this boho top with ripped denim. It's the simple things. The Blush Zohar Plunging Blouse is a wardrobe standby you can count on. With a swing cut and long sleeves, the plunging blouse has a deep v neck with criss cross straps to keep things interesting as you take it from day to evening (which you will). Pair this boho top with ripped denim. It's the simple things. The Cream Zohar Plunging Blouse is a wardrobe standby you can count on. With a swing cut and long sleeves, the plunging blouse has a deep v neck with criss cross straps to keep things interesting as you take it from day to evening (which you will). Pair this boho top with ripped denim.